Get instant results from your putting stroke! Read "Ruthless Putting"
Check out the new RuthlessGolf.com Quick Guides! Isn’t it time you learned why some people putt well... and why others don’t? You've tried to improve. You really have. You’ve bought expensive putting aids that promise to teach you how to putt. You’ve taken expensive putting lessons from big-name teachers. But you still don’t improve. You’ve tried all the new putting tips and spent hours doing all those boring putting drills. So tell me... isn't it time to make a change? Why waste hours, days, or even weeks trying to learn a new putting stroke… when you could become a SCORING MACHINE with the one you've already got? Wouldn't you like to stand over a putt and KNOW that your putting stroke will send it down the line you've chosen? That the distance your putt travels is the ACTUAL distance you intended it to travel? And that, if you don't make it, your next putt will be a TAP-IN? Have you given up hope of putting this well, simply because you don't have much time for putting practice? Because every teacher you hear on TV says something different? Because you can't afford expensive putting lessons? Or perhaps you're one of those golfers who suffers from the putting yips, and you've been unable to find any lasting help. Then you need Ruthless Putting. After hearing different putting teachers like Dave Pelz or Stan Utley, you may believe that their putting technique is the only "correct" way to putt and that, if you really want to make more putts, you need to putt the way they and their students do. Are you confused? It’s no wonder. 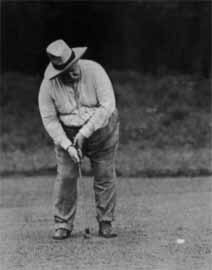 Each teacher claims that his putting technique is the best, the most "mechanically simple", the most "natural" way to putt. Each claims the other manipulates the face of the putter, complicating an already difficult move. How, you may wonder, do the pros decide whose putting technique they will use? The answer may surprise you. The best putters on tour—whether it's the PGA, LPGA, Champions, Nationwide, European, or any other tour—have all developed their own putting techniques; sometimes they copy Pelz or Utley, but just as often they don't. And sometimes, when their current technique stops working, they create an entirely new way to putt! Ask any one of them for their secret, and each of them will tell you something different—a swing thought, a setup tip, or a visualization that works for them. Most of them will confess that they became good by trial and error. Wouldn't you rather be playing than practicing? What if you could SKIP all the trial and error? What if someone could show you a few simple principles that apply to every putting stroke, and then showed you how to put those principles to work in YOUR OWN PUTTING STROKE? You would see massive improvements in your putting almost overnight! Then you're ready for Ruthless Putting. Let's face it… you have a life. You work, you spend time with your family, and, if you're lucky, you get to spend a little time playing golf. You don't have the time to run to a practice green every day to practice a new putting stroke. You may not even have the space at home to practice your stroke, especially if you have kids. (And let's face it—the carpet in most homes is nothing like a real green.) WHAT YOU NEED IS A WAY TO IMPROVE YOUR PUTTING STROKE THAT DOESN'T TAKE A LOT OF TIME OR SPACE. You need a low-maintenance putting stroke, one that doesn't take a lot of practice to maintain… one that works when you get to the course, even if you haven't been able to putt for a while. That's exactly what Ruthless Putting delivers. Professional golfer Mike Southern takes you step-by-step through the basic principles that turn a weekend golfer into a confident putter. You won't just learn a single technique for stroking the ball; you'll learn how to make the ball do what you want and how apply this knowledge to your current putting stroke, NO MATTER WHAT THAT PUTTING STROKE LOOKS LIKE NOW! The 7 Basic Principles used by ALL good putters, both past and present, as gleaned from the work of Dave Pelz, Stan Utley, and Bobby Jones. The 4 basic putting styles common among effective putters… and identify which one best matches your current putting stroke. How the way you grip your putter can help or hinder your putting stroke… and how to match a grip to your stroke. The physical adjustments that can be legally made to your putter and how they can solve persistent putting problems. Why reading greens is so hard, and the basic principle that will speed up the process. How to beat "the yips" without expensive training aids… and NEVER be plagued by them ever again! The best situations in which to use your putting stroke from off the green… and when you should use your putting stroke with a club other than your putter. How to quickly identify the causes of your putting problems… and fix them just as quickly. You'll learn these techniques and principles without any expensive training equipment. In fact, you'll find that you have the few materials necessary right there in your own home! You may be skeptical of these claims. After all, multi-day putting seminars can cost hundreds of dollars, as can the dizzying array of high- and low-tech training aids that promise to make you a better putter… and they ALL tell you up-front that daily practice is required. How can one little book promise to make such a huge difference in your game with little or no practice? Any stroke can benefit from the helpful tips in Ruthless Putting! The answer is familiarity. Ruthless Putting doesn't teach you a new, unfamiliar putting stroke. No, the "secrets" you'll learn in Ruthless Putting are moves you already use successfully every day, many of them without consciously thinking about them, and you'll learn how to incorporate them into your existing putting stroke. The real secret to learning anything rapidly and efficiently is making connections between the skills you want to learn and the skills you already know. Ruthless Putting does just that. Using these already-familiar movements, you'll be able to make rapid progress in your ability to strike putts on the line you choose with the speed you choose. And if you struggle with the putting yips, you'll learn how using your natural moves—coupled with a clear understanding of what causes the problem in the first place—can enable you to beat them once and for all! The paperback version of Ruthless Putting retails for $13.99, and is available from Amazon.com, BN.com, and Amazon.co.uk. It's also available in Amazon Kindle and Mobipocket versions for $8.99. But if you want the PDF version of the ebook, you can download it ONLY from this site! You can use either Paypal or the credit card of your choice. You'll quickly receive an email with a download link, and you can start improving your stroke TODAY! And when you download the Ruthless Putting ebook, you'll also receive the FREE EBOOK Ruthless Chipping! Learn how to take the same simple putting stroke you'll use on the greens and turn it into a deadly chipping stroke... using the same basic principles! Do your game a favor and get both the Ruthless Putting and the FREE Ruthless Chipping ebooks for the low price of only $8.99. Your foursome will wonder how you became a short game wizard in such a short time! ACT NOW!